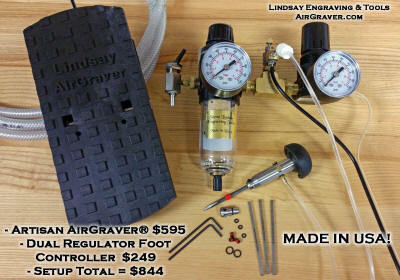 Foot control AirGraver orders generally ship in 3 to 5 working days and PalmControl orders in 10 to 15 working days. Orders over $400 ship by FedEx. Overseas orders for AirGravers and PalmControls ship by FedEx International. There is more information about the Artisan™ AirGraver® and this set at this link. Leather pouch, extra screws, o-rings, wrenches, handpiece tubing and connectors, compressor braided hose and owner's manual. -Presharpened Carbalt graver (sharpened with the universal template). - Three high speed steel 3/32" square graver blanks. - Sharpening fixture with 116 degree universal template. -CO2 adapter for small 16 gram threaded cartridges. 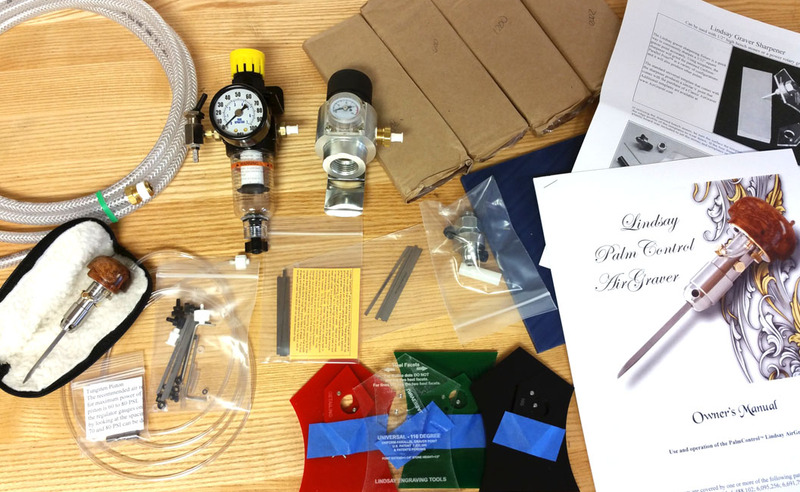 -Leather pouch, extra screws, o-rings, wrenches, handpiece tubing and connectors and owner's manual. PalmControls are shipping in approx 15 working days from receiving payment. A 567 gram (20 oz) paintball CO2 cylinder generally lasts around 8 hours and a 16 gram cartridge as pictured to the left 20 minutes. Visit the CO2 page for information about the CO2 regulator, adepter and the PalmControl. Here is a forum thread link about the efficiently the AirGravers are with air and CO2 usage. 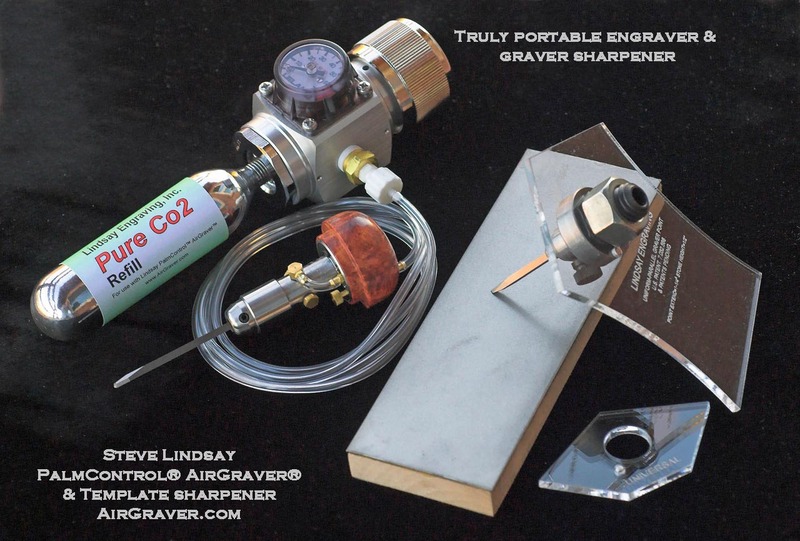 The sharpener in this set includes a 3000 diamond bench stone. This is the stone that is used for re-sharpening a dull or broken ponit. In order or you to sharpen the 3 HSS graver blanks that are included with the set you will need at minimum a 260 diamond bench stone. Below are "add to cart" links for it as well as the 600 and 1200 grit stones. Here is a thread and video about Accurate and quick re-sharpening. Sharpening instructions and information are on the engraving school site. 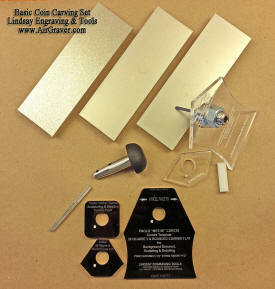 For additional templates to sharpening other graver shaped points visit the sharpening page. 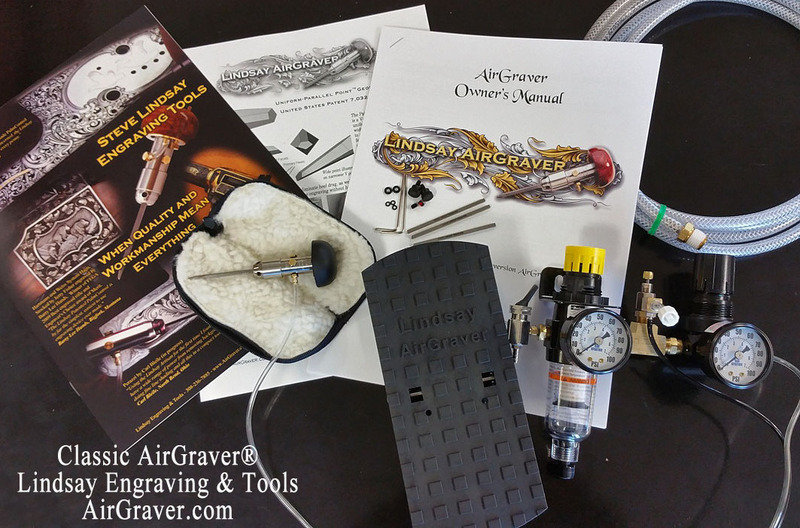 For 95% of the engraving style that Steve Lindsay does he uses a Carbalt 116 universal point that is included with and installed in the PalmControl®. Classic™ PalmControl® handpiece with Burl handle or a NitroG20 PalmControl® h.p. 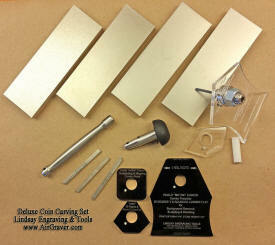 Please note -- The main sharpening page with all the various sharpening templates is at this link. Includes: Sharpener with fixture and all four diamond bench stones (260, 600, 1200, 2000), plus 4 templates: Universal 116 degree, Detailing, 105, and Flat & Knife Combo. Note: if you are wanting this set without one or more of the items for to exchange one of another, you can order this set as it is and during checkout write a note in the place provided what you'd like to add or subtract. Go through with the order that way and then we can refund or send a PayPal request for any difference in price.